Let's Go Fishin with Colorful Fish! Have you ever wanted to go fishing but could never get the chance or option too? Well now you can in the comfort of your very own home. Somewhat.... this is "Let's Go Fishin' The Game" with a title like that you can already picture what to expect from it. 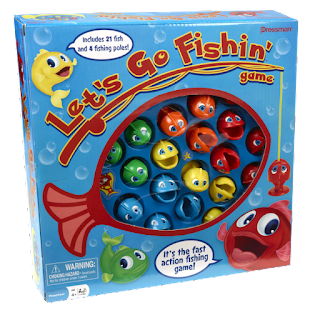 As it says it is a game with 21 fishes, 4 fishing poles, that is a fast action fishing game for preschoolers aged 4 and up! Now this may be aimed at a younger crowd but anyone of any age can still enjoy it. Personally speaking, 30 years of age in fact, remembered this title as a kid myself, growing up, enjoying it. My version being long gone but is not found in this revised title of the same game! How the game is set up is rather simple, you get a round shaped board with the 21 fishes, and 4 poles to fish each fishy out with, as after putting them in, batteries placed, the machine with the fishes starts up. 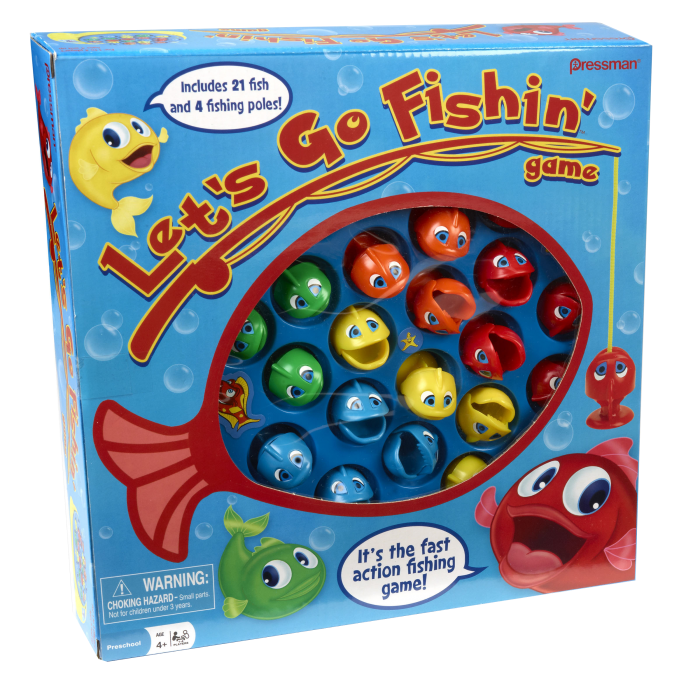 As the fishes jiggle and move themselves and their mouths as well, you must use your pole to scoop them up, the player with each fishes wins. Each player accompanied by each fish, there being yellow, green, red, blue, orange fishes. So you do get the added bonus of 5 fishes instead of just four, but it makes the four poles to fish them out more addictive and challenging as well. Nevertheless though, "Let's Go Fishin The Game", just brought back so many memories for me, as I played it yet again. Catching the fish in question, just being so rewarding and fun. The way the fishes look up at you, with their facial expressions, is so goofy it makes you smile, as your playing alone or among friends or family, as again this is a title for all ages I'd say, than just the demographic standard age range it depicts. All in all though this title is just as fun as the real deal. Except this version allows for you to not get wet during the fishing process! Making it really some good old fish clean fun!